This product is now obsolete and has been replaced by the Kane 9206 Quintox Emissions Monitoring Solution. 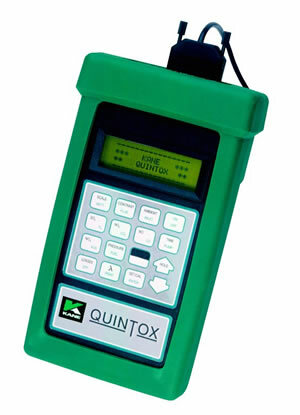 The KM9106 Quintox has established itself as the most cost effective and versatile portable analyser. From its most basic form as a boiler tuning analyser it provides a versatile and cost effective platform that allows enhancements up to a fully portable semi-continuous emissions monitoring system. The KM9106 features a rugged combustion probe with detachable stainless steel shaft, incorporating integral thermocouple. A comprehensive range of probes is available, allowing smoke measurement, higher temperatures and longer shafts. Clear, backlit, 4 line display. Displays preset pages or personally configured individual screens. Tactile keypad - simple to use. Handset stores up to 1926 boiler tests. Handset can download direct to PC. Remote handset with protective rubber boot. When taking toxic gas readings to comply with a regulatory body, you normally have to reference them to a certain oxygen level. The Quintox will automatically display to a specific reference in either ppm or mg/m3. This type of referencing is sometimes termed as 'diluted and undiluted readings' or 'oxygen free readings' when referencing to zero O2. All combustion parameters are shown on the handset�™s large 4 line display, to allow the operator to see changes to boiler settings instantly. Each line of the display can be configured for Oxygen, Carbon Monoxide, Carbon Dioxide, Efficiency, Flue and Nett Temperature and Excess air. Over 70 different fuels are programmed into the Quintox to allow it to calculate values all over the world. A custom fuel option is also built-in to accommodate those fuels not yet established. Pump on/off control via handset. WTS9106P - Automatic water extraction to eliminate the risk of an overflowing water trap. KM9106PUR - Main purge solenoid to facilitate regular automatic fresh air purging to refresh the electrochemical sensors whilst long term monitoring. KM9106HPUR - Changeover solenoid and purge pump to allow automatic switching between low and high range CO sensors. This provides protection for the standard CO sensor in situations where controlled combustion has not been established eg; during boiler commissioning. The high CO sensor is rated to 10%. 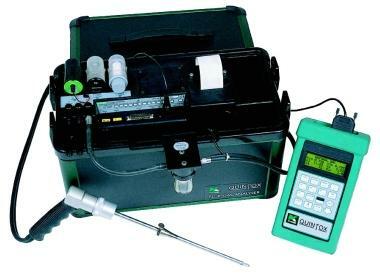 This analyser is also compatible with the Kane Fireworks Software.